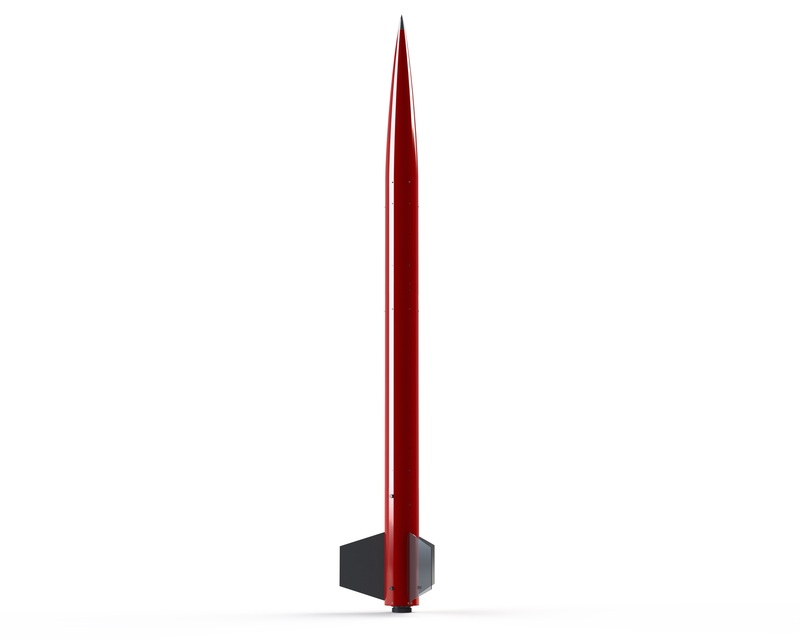 Rendering of the final geometry of the rocket. Two of the components that were incorporated into the final design have been unavailable for a significant amount of time. These components are the large airfoiled rail buttons and the Aerotech DMS M1350W motor. The airfoiled rail buttons are now replaced with the standard, large rail buttons. Luckily, since both styles of rail buttons use the same size hardware, no internal changes are needed to support them. The change in vehicle weight is negligible due to this change as it is less than 0.01lb (0.04N). Rendering of the fin can section subassembly showing the round rail buttons. The M1350W was replaced with a CTI Pro 75 M1670 motor. This 5 grain motor will produce 374.9 lbs (1668N) of thrust on average over its 3.63 second burn. Since this motor is a reload, it will be used with the Pro 75 5 grain case. The loaded weight of this motor is 11.53 lbs (51.3N) compared to 10.6 lbs (47.2N) of the original motor. It is also 32.04in (814mm) long compared to 25.12in (638mm). This motor will protrude from the motor mount tube approximately 3.70in (94mm), however 1.75in (44.5mm) of this protrusion is only 1.88in (47.6mm) in diameter. This should have a minimal effect on looping the shock cord through the upper U-bolt. When investigating the effect of this change, it was noticed that the epoxy fillet on the bulkhead attached to the motor mount tube was on the wrong bulkhead. This is now corrected in the render below. The center bulkhead under the coupler is now epoxied to the motor mount tube. Section view showing the corrected location of the epoxy fillet on the center bulkhead. Another change that was needed due to the original part not being available locally was the quick links used throughout the project. Instead of the 2.75in (70mm) long, 3/8-16 thread quick links, a 2.375in (60mm) long, 5/16-18 thread quick link will be used. These new quick links weigh 0.16lb (0.71N) compared to the 0.28lb (1.25N) of the original. Their working limit is 1540lbs (6.85kN), which is comparable to the swivels used at both the main and drogue parachutes. Also, due to line connection on the main parachute, an extra quick link will needed to connect the swivel to the parachute. The total weight changes due to the change in quick link size and quantity is only 0.32lb (0.53N).